These straight razors are 6.5 inches long when closed. Blade is 2.75 inches long and made of 440 stainless steel. 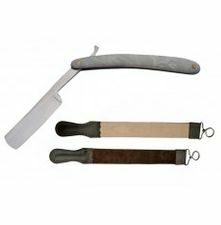 This is a heavy duty straight razor that will last for years. Comes out of the box pretty sharp. Weighs 3.7 oz. Very nice item for the money. Also available is the razor and 20 inch leather honing strop together for a bigger discount. Not cheap enough? See below.